Reason being, had they purchased it using the link above, the nice folks at Amazon would have been nice enough to give ole Noah what the waste management professionals on the Sopranos call "a taste." But seriously, if you value this project, the photos, the people therein, and my often mildly offensive commentary, do yourself - and more importantly, do me a favor - by hereto-forth using the hyperlinks above to purchase your oppressively expensive camera gear as doing so returns a commission from Amazon to me. The man you see pictured above is Detroit City Council president Charles Pugh. Before he was elected to the city council in 2009, he was both a reporter and anchor on the local Fox affiliate and a host and news director for a leading R&B and hip-hop radio station here in the city. It is also worth mentioning that in January 2004 Charles emceed a conference in Detroit on homophobia This resulted in him publicly confirming with local media that he was gay - something that friends and colleagues already knew. That made him one of the few openly gay media figures in Detroit and, consequently, the first openly gay city council person. I just happened to run into him while I was getting a lil work done in the relatively distraction-free sanctuary that is the multinational coffee juggernaut franchise Starbucks. Though my sometimes unsentimental disposition would suggest otherwise, I am actually a very empathetic soul. I am fairly adept at projecting myself into the emotional state of others. I imagined that Charles is approached non-stopped by citizens pitching ideas, complaining, asking for jobs, etc. I also imagined that over the course of days, weeks, and years that can wear on a person's affability. I mean, even city-wide leaders have afternoons where they just want to get a cup of coffee without having to shake the entire city's hand. So, with these imaginings in mind, I planned on passing along one of my newly-minted cards for TPOD, giving a brief overview of the project's purpose, and keeping it moving. But as soon as I started to explained that I launched TPOD as a counterpoint to national media coverage of Detroit that was at times accurate, but rarely comprehensively representative of how life is led in the city, Mr. Pugh immediately was not only welcoming of my intrusion, he began offering suggestions about how to get local coverage for the project. We ended up having a hour-long conversation about the state of the city and what government and individuals need to do to move it forward. I found Charles to be uncommonly genuine. And not genuine in that prefabricated, safe, platitude-infused way that politicians often are. But genuine in the way that you would expect of a person who lives in a community and is emotionally vested in its fate. Which is consistent with what I observed about Charles going back before he was a council person. Its not surprising that I would run into him at Starbucks, because ever since I moved back to Detroit seven or so years ago from Michigan State University in East Lansing, I've frequently seen Charles about town - at children's dance rituals at Marygrove College or just out and about around town in general. 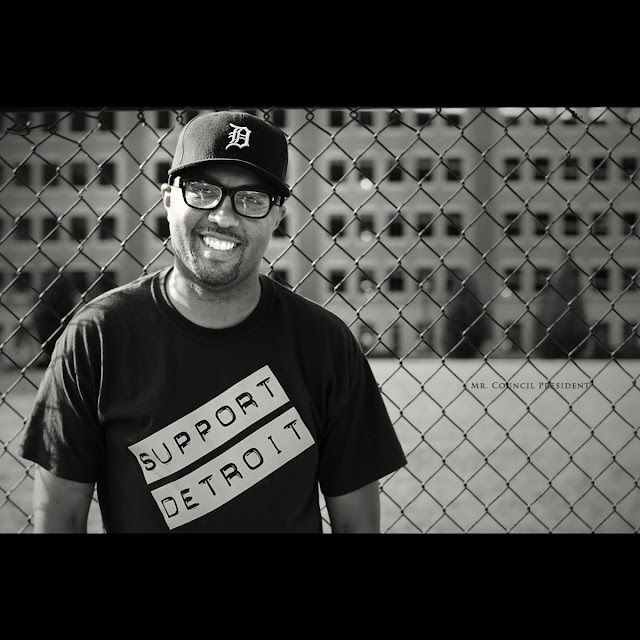 Its blatantly apparent right down to the t-shirt by my man James Morris over at DSE that Detroit is Charles' home and he cares about where it is going. In the last post, I was frustrated with certain kinds of people I encounter in Detroit. Encountering Mr. Pugh has helped assuage that frustration and reminded me of all that is possible when passionate people take action. Interesting story. I'm envious of you because of all the cool people you've met throughout the course of this project. I saw him at the African World Festival last weekend (or whatever weekend that was). Niice! I agree, I remember seeing him years ago at WC3 when Bill Cosby spoke and him giving me a simple compliment as I passed by and at the time I didn't know who he was but figured he was some sort of reporter because of the news van. I simply said thanks and that was it. Afterwards I found out who he was and that aside from the negative remarks of him being gay that he was a wonderful person and cared alot about the city. Side note: In addition to your great pictures you are a wonderful writer.